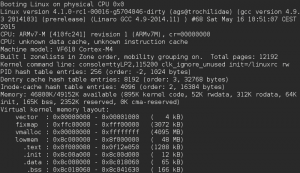 This is a status update about my work on Linux for Cortex-M4 inside Freescale Vybrid SoC’s. While I managed to boot Linux on the M4 core since fall last year, several improvements have been made since then. Peripheral interrupts need to be routed to the core requiring them. The routing is done by the interrupt router inside MSCM (Miscellaneous System Control Module). So far, the boot loader (U-Boot) configured all interrupts to the primary core. A proper driver for the interrupt router was missing, hence to get Linux running on the secondary core, manual fiddling of the interrupt router registers was needed. The IRQ domain hierarchy feature merged in 3.19 was an excellent fit to write a driver for the MSCM interrupt router within Vybrid: The hierarchy allows to model the interrupt controllers as stacked entities, which is exactly how the interrupt controllers are arranged in Vybrid. A interrupt needs to be routed to the CPU local interrupt controller through the MSCM interrupt router. Hence the standard device-trees for the Cortex-A5 CPU stack the MSCM-IR and GIC whereas the device-tree for the Cortex-M4 CPU stack the MSCM-IR and the NVIC interrupt controller. The driver has been merged in the v4.1 merge window, however this version only works with the GIC (and hence the primary CPU). But patches to enable the driver in conjunction with NVIC will likely make it in the v4.2 merge window. The mini-loader for the Cortex-M4 makes the hacked Linux kernel entry code (head-nommu.S) obsolete. 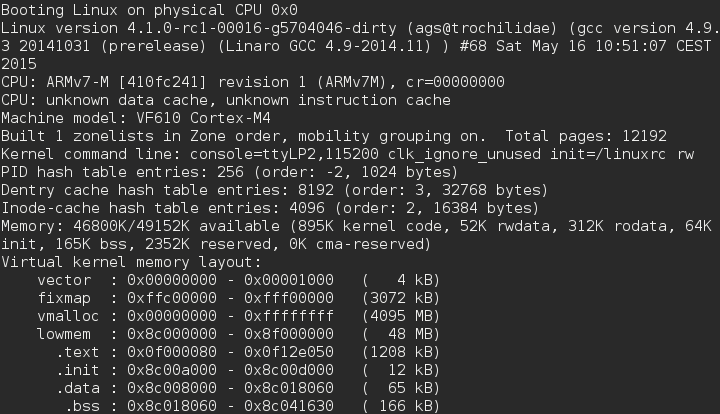 It essentially copies the pointer to the device tree file from SRC_GPR3 (PERSISTENT_ARG1) to the M4 CPU’s r2 register. The mini loader is included within the m4boot utility for Linux and part of the U-Boot support for Cortex-M4 (see below).